Daily Illuminator: Free Dice In December! 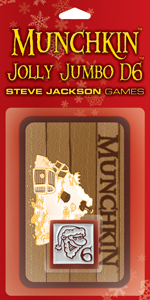 November 25, 2013: Free Dice In December! Do you like free dice? Of course you do! Well, during the season of giving, you'll be able to get some! Starting December 1 and continuing until December 15, any time you place a Warehouse 23 order of $50 or more, you'll get a free random Jolly Jumbo d6! Buy $75 or more and get both packs!